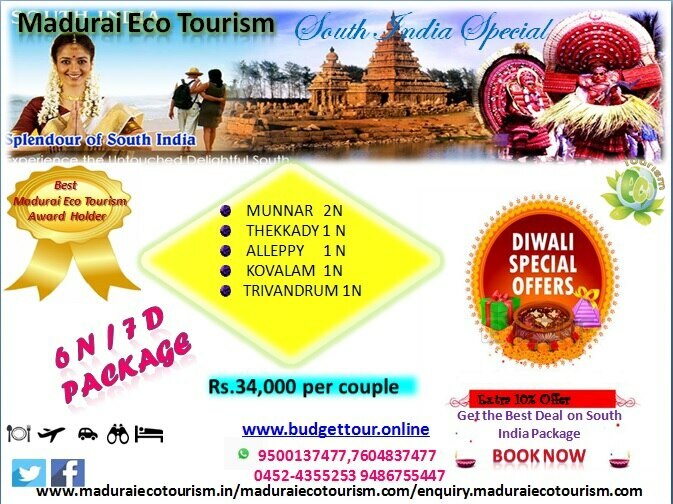 TAMILNADU EDUCATIONAL TRIPS / BUDGET PACKAGE TOUR Welcome to Madurai Eco Tourism, one of the Best Eco-Friendly tour Provider in India. We Organize School Trip/ Field Trip for Students to Provide them Knowledge About Nature, Communities, Exotic Locations, and Many More. The Tour Packages are Designed to be Informative and is Sure to Create Awareness Among the Young Minds to Love, Save and Protect Nature, Enhance Adventure Sense and care for the Wild Life and Plant Species. The Trips are Sure to Produce Civilized Young Men and Women who Appreciate Culture and the Arts Along with Providing a Common Ground with more-Advantaged and Less-Advantaged Children to Have Some of the Same Cultural Experiences in the arts. To have an enjoyment all over South Indian Package Tourism, Adventure trip(trekking, bird watching), religious and spiritual worships and understand each other in a better way and to create a team work and build a bonding with tourism industry in south India and environmental by the trend ecotourism and south Indian tourism. We travel through rural areas to make aware of locale’s lifestyle, culture, customs, and also to experience the nature’s beauty in its purest form. To integrate learning with travel to religious and spiritual places and also trekking, we conduct experiential learning program, designed by Mr.S.Suthagar Selvaraj, founder of Madurai Ecotourism and South Indian Tourism. We hope for the mutually advantageous cooperation between our companies.We will be highly pleased if you choose Madurai Ecotourism and South Indian Tourism. To Have An Enjoyment All Over South Indian Package Tourism, Adventure Trip & (Trekking, Bird Watching), Religious and Spiritual Worships and Understand Each Other in a Better Way and to Create A Team Work and Build a Bonding With Tourism Industry in South India and Environmental by the Trend Ecotourism and South Indian Tourism. We Travel Through Rural Areas to make Aware of Locale’s Lifestyle, Culture, Customs, and also to Experience the Nature’s Beauty in its Purest form. To Integrate Learning with Travel to Religious and Spiritual Places and also Trekking, we Conduct Experiential Learning Program, Designed by Mr.S.Suthagar Selvaraj, Founder of Madurai Ecotourism and South Indian Tourism. We hope for the Mutually Advantageous Cooperation Between our Companies.We will be Highly pleased if you choose Madurai Ecotourism and South Indian Tourism.